I used to work at a gym many years ago and what surprised me was the large number of new members we would gain between mid-January and mid-March. The surprising part was how many of those were consistent for four to five months and then by November would taper off and I never saw them again. If this is familiar for you too or if you know someone who is like this, who sets new year’s resolutions but “falls of the wagon” at some point during the year, then the 4 tips included in today’s edition are a must for you to read and test out for yourself so that your new year’s resolutions actually work! If you have already set your new year’s resolutions in place that’s great and I wish you all the best and success with them! Typically though, about 85% of those who set their intentions for the new year never achieve them. To avoid “falling off the wagon” with your new year’s resolutions and instead help you to create an incredible 2008 year, here are the top 4 reasons why new year’s resolutions don’t work and how to apply these principles so that you do stick to your resolutions and manifest what you want! 1. People aim too high, too far and go too big with their goals for change. Do you know of someone who was overweight who decided they would lose 100 pounds in the year!? Do you know of a small business owner who decided that he/she wanted to reach $1,000,000.00 in income this year… after only reaching $40,000.00 last year (even working 40 hour work weeks at 100.00 per hour for 50 weeks of the year adds up to only $200,000.00?!) How about someone who now wants to meet his/her perfect life partner after being single and not dating for three years? Although these goals MAY be possible, they are also way too high and far off, to a certain degree illogical and unrealistic. And typically, we achieve and attract only what is reasonable and logical to us. That is how we are wired. Instead, the key is to create a goal that seems more realistic to you. For example if you weigh 250 pounds and your ideal weight is 130 or 150, decide that this year, you will target 200 and make your focus eating and drinking differently, adding in some simple trampoline jumping or other exercise. Strive for achieving an income of $100,000.00 or more depending on what is really possible for you. Begin looking into meeting people through the internet, through friends and in social situations. Now, what may happen instead of reaching just 200 pounds by year’s end, you actually reach 175… which is even better. Perhaps you reach $135,000.00 income by January 1st, 2009 or begin dating someone you connect with who a year later you marry and a year after that have children with. The challenge often with New Year’s Resolutions is that we aim way too high, and year after year fail to achieve our resolutions. In time, we give up even setting intentions because of all the times that we did not succeed – simply because we aimed for something that sounded good, but that wasn’t logical or reachable for us. 2. Our goals are too big all at once and a shock for our systems. 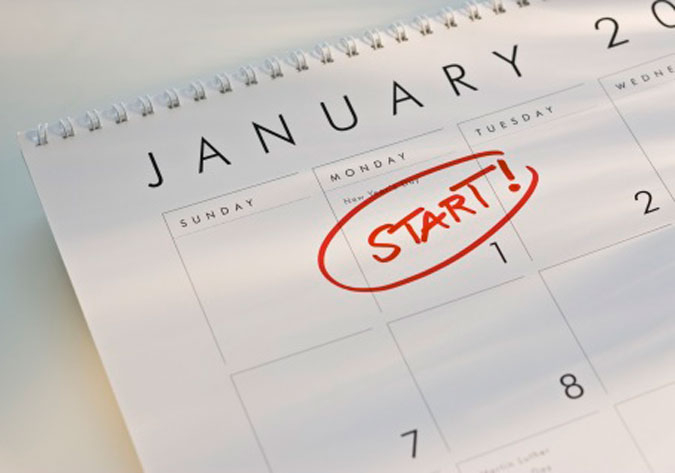 The key is to instead break down the resolutions into manageable pieces. Instead of saying I will completely avoid sugar, coffee, and wheat beginning January 5, 2008, set smaller targets or dates throughout the year. For example, January 5, 2008, I will eliminate coffee or reduce it to once per day. By February 5, 2008 I will eliminate wheat, and so on. By breaking it down, you make it easier and less daunting and your chance of success and sticking with it will increase dramatically. Take it from me as an all or nothing kind of guy! 3. The success of your goals and the manifestation of your desires has already been pre-determined by the negative emotions driving you. Then a week later, notice how the convincing has continued each day! And here is how this comes full circle… Your desire to lose weight, increase your income or attract your life partner or greater social connections comes from wanting to get away from what you don’t want. And there is no way to get away from what you don’t want. The only way to really create losing weight is by focusing on experiencing optimal weight or good health. The only way to avoid not having money, insecurity, and lack is by focusing on the experience of having money, security, and financ!al freedom. If the underlying emotions are not released or shifted, in one way or another at some time, sooner or later, those emotions will sabotage your focus, actions, and therefore your results and performance. So it is important to shift those unconscious beliefs or release those emotions so that they no longer have any hold on your actions and focus. As a result, your resolve will be strong and free from saboteurs! 4. We can feel alone in the quest of achieving our resolutions and may not necessarily have the belief built up in ourselves yet that we CAN achieve the results we want. There is a great acronym for TEAM. Together Everyone Achieves More. This is similar to the concept of 1 + 1 = 11. One of the greatest aspects of being human is that we are social creatures. Whether extroverted or introverted, it is innate and natural to connect with one another. With that said, one of the best actions you can take to help you to achieve your desires is tell your friends and/or family **(only the ones will support you 100% and not doubt your ability to achieve what you want)** about what you want to create. You could even have each close friend share one thing he/she wants to create in 2008 and then create a once per month group of friends who will support each other in the achievement of the resolution. Remember this is one of four and although I don’t recommend relying on other people, supporting each other will benefit everyone! Create a goal that seems realistic to you – perhaps even research it to be sure that it is even attainable and possible. Break down the resolution(s) into manageable pieces over time and set dates in your planner for them. Work through your unconscious beliefs and release the emotions that are driving you – a life coach or therapist can be of great value for this. Until next time, may you have an incredible new year and may it be truly inspired!